Over the winter of 1977–78, anyone within shouting distance of a two-mile stretch of Boston’s Commonwealth Avenue—from Fenway Park to the trolley curve at Packard’s Corner—found themselves pulled into the orbit of college hockey. The hottest ticket in a sports-mad city was Boston University’s Terriers, a team so tough it was said they didn’t have fans—they took hostages. 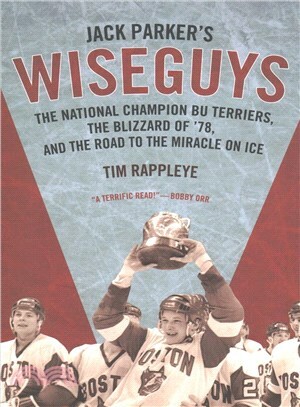 Eschewing the usual recruiting pools in Canada, Jack Parker and his coaching staff assembled a squad that included three stars from nearby Charlestown, then known as the “armed robbery capital of America.” Jack Parker’s Wiseguys is the story of a high-flying, headline-dominating, national championship squad led by three future stars of the Miracle on Ice, the medal-round game the 1980 U.S. Olympic hockey team won against the heavily favored Soviet Union. Now retired, Parker is a thoughtful statesman for the sport, a revered figure who held the longest tenure of any coach in Boston sports history. But during the 1977–78 season, he was just five years into his reign—and only a decade or so older than his players. Fiery, mercurial, as tough as any of his tough guys, Parker and his team were to face the pressure-cooker expectations of four previous also-ran seasons, further heightened by barroom brawls, off-the-ice shenanigans, and the citywide shutdown caused by one of the biggest blizzards to ever hit the Northeast. This season was to be Parker’s watershed, a roller-coaster ride of nail-biting victories and unimaginable tragedy, played out in increasingly strident headlines as his team opened the season with an unprecedented twenty-one straight wins. Only the second loss of the year eliminated the Terriers from their league playoffs and possibly from national contention; hours after the game Parker’s wife died from cancer. The story of how the team responded—coming back to win the national championship a week after Parker buried his wife—makes a compelling tale for Boston sports fans and everyone else who feels a thrill of pride at America’s unlikely win over the Soviet national team—a victory forged on Commonwealth Avenue in that bitter, beautiful winter of ’78. TIM RAPPLEYE played in the 1978 NCAA Division II hockey championship while Boston University was winning its Division I crown. He was bitten by the Olympic hockey bug while working on the 1980 Miracle on Ice for ABC Sports. He covered another half dozen Winter Games as a researcher, producer, and reporter. Rappleye later produced the 1991 NCAA Hockey championship between BU and Northern Michigan for ESPN, which became known as College Hockey’s Greatest Game. He currently writes long-form hockey stories for New England Hockey Journal when he isn’t teaching public school or playing pond hockey. Tim lives in Traverse City, Michigan, with his wife, Amy, and dog Seamus.